On 16th December 4 Christmas parties were held for 50 local children ( aged for 4 to 17) organised by Darlington Association on Disability. The Lions club went along to help and £1,300 from a summer ceilidh was used to subsidies the parties, buy presents and equipment. Below is a selection of photos taken at the event. Top left - Lion president playing a balloon game. Top right - Lion president helping with LEGO building. Bottom left - Decorating biscuits with icing. Bottom right - Alfie King having a good time. 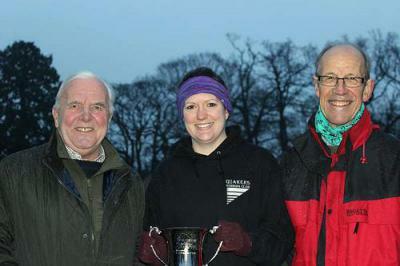 Every year Darlington Lions sponsor the " Volunteer of the Year" within the participants in the local Park Run. In December Arron Sparrow - Woods was presented with his award by club president Lion Jenny Lumley. Arron is a dedicated member of the organising team and the award is in recognition of his assistance in time keeping, results recording and general management of the weekly event. 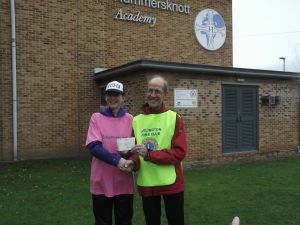 Above Arron is presented with his trophy by Lion President Jenny Lumley and Arron with his trophy along with a group of fellow runners from the event. In December the club presented a cheque to The Darlington Association on Disability. The £1,300 was raised at a ceilidh held in the summer. The funds will go towards the cost of presents for the children at their annual Christmas party. The photo shows :- Left to right Alfie King ( back), Vinnie Earl, Oscar Earl,( front ) Ethan Martin, Graham Pybus ( Chair of DAD ) & Lion president Jenny Lumley. August 2017 saw the completion of our LIONS DEN. This seat and pergola was sponsored and part funded by the club to mark 100 years of Lions International. 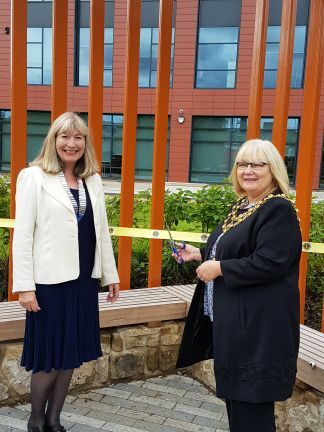 The den is located within the new riverside walkway at Feethams in the town. The landscaped area is the final piece in the jigsaw which saw the regeneration of the site of the old bus station with the provision of new offices, a hotel, a multi screen cinema and a host of restaurants. Situated on the banks of the River Skerne it is a convenient stopping point where one can relax and enjoy the park and the wildlife around the banks of the Skerne. Lions Den in use - note plaque set into the paving stones. Granite plaque incorporated into the paved area in front of the Lions Den. Darlington Lions assembled for the opening ceremony. In March Lion Denis Pinnegar the immediate past president of Darlington Lions Club was delighted to present a further cheque for £1650.00 to the Darlington Branch of the Marie Curie Nurses. This latest donation was the proceeds of the Darlington Lions Club Annual Craft Fair . Marie Curie Darlington was the main chosen charity of Mr Pinnegar in his year of office and in that time he was able to present a further £5000.00 to the Darlington nurses. Darlington Lion Denis Pinnegar - Immediate past president Darlington Lions Club. Linda Norminton - Marie Curie Darlington volunteer . Pat Irving - Marie Curie Darlington volunteer . Darlington Lions Club president Ian Barnes recently presented the Darlington Lions Club trophy to this year's winner Karen Newton. Darlington Lions were one of the main sponsors of the Darlington parkrun when founded in 2013 and Lion Ian who is also a very keen runner remains the Run Director of the event. Lion Ian commented that it was always a fun and community spirited parkrun and he was delighted that each year the event had grown from strength to strength. Above photograph :- left to right. Winner of the volunteer trophy - Karen Newton. Darlington Lions Club president Ian Barnes. MARIE CURIE - £5,000 PRESENTATION. At the club's annual charter dinner a cheque for £5,000 was handed over to the local branch of Marie Curie care. The picture below shows ( centre ) Leigh Taylor holding the cheque and on the right is club president Denis Pinnegar who chose the Marie Curie Care Nurses as his principal charity for his year of office. DARLINGTON HARRIERS 125TH ANNIVERSARY CELEBRATIONS. Darlington Lions Club were very proud to sponsor the medals for the day's running events. Lions Club President Denis Pinnegar presenting medals to the mile race winners -1st Greg Jarasuryia - 2nd Sparrow Morley - 3rd James Dunce. Darlington Lions Club visited the Gateway club in May and were able to present a cheque for £500 which will be used to purchase special Equipment. The president of Darlington Lions Club Denis Pinnegar said the club was delighted to make this presentation and wished the Gateway Club every succsess in the future. and thanked the Darlington Lions for their wonderful support and generosity. Robert Letten - - Gateway. Lion Neil Anderson - Chairman of Services - Darlington Lions Club. In April Darlington Lions attended the Parkinson's Group Annual Open Day where they presentated Mr. & Mrs. Grantham with week's holiday in a specially adapted caravan located in Filey. Pat McCarthy Branch Chair, Darlington Parkinson's Group. Michael & Kathleen Grantham, Darlington Parkinson's Group. Bob Martin, Darlington Lions Club. CHRISTMAS PARTIES FOR ALL AGES !!. Club President Denis Pinnegar and several Darlington Lions attended the DAD (Darlington Association on Disability) Children's Christmas party which is also sponsored by the Darlington Lions Club. 45 Children attended the party at West Lodge Darlington where they all enjoyed playing party games, party food and Christmas gifts. Saturday afternoon at the Elm Ridge Methodist Church Hall . Afternoon tea with loads of sandwiches and cakes was prepared by the wives of the Lions and served to the guests by the Lions. Entertainment followed with live music from the Darlington band Willow Creek followed by Christmas crackers and carol singing. Darlington Lions Club was one of the original sponsors of the Darlington South Park run when it began three years ago and each year the Darlington Lions Club president presents the Lions trophy to the park run volunteer of the year which is awarded for their outstanding contribution to the event. 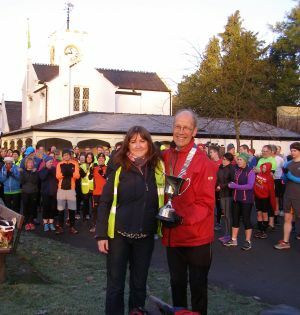 Darlington Club president Denis Pinnegar attended the run on Saturday morning to present the trophy to the 2015 winner volunteer Rachel Wood. Denis Pinnegar presenting the volunteer of the year trophy to this year's winner Rachel Wood. Over the Christmas period and into this New Year Darlington Lions Club were able to donate over160 food parcels to various local organisations including the Salvation Army, Women's Refuge, Darlington Food Bank and other local needy appeals, Members of the club collected over three thousand pounds with their annual tin shakes in local supermarkets. Club president Lion Denis Pinnegar thanked Darlington shoppers for their extreme generosity to make all of this possible. raising collections and events are currently being planned including their annual charity concert which will take place on Friday 24th June at All Saint's Church Ravensdale Road when the Sans Pareil Singers and Two's Company will be providing an evening of lively music and entertainment. This summer Mrs De Martino was able to present a cheque for four thousand pounds to ECCDS which had been raised at the Darlington Lions Club annual charity concert and other recent fundraising events. Mrs De Martino said she is now looking forward to visiting ECCDS later in the year with a further donation of the proceeds from the Lions Annual Craft fair which will take place at the Blackwell Grange Hotel this November . Pat De Martino - president of Darlington Lions Club Denise Bainbridge - ECCDS. Darlington Lions Club recently supported the Marie Curie Great Daffodil Appeal when they collected £569 in just two hours in Darlington Town centre. Club president Lion Pat De Martino thanked the shoppers of Darlington for their overwhelming generosity for donating so much in such a short time and this week she was able to visit the meeting of the Darlington branch of Marie Curie to present the cheque. providing nursing as well as supplying support to their families at an intensely difficult time. Darlington Lions Club president Pat De Martino and Lion Denis Pinnegar present the cheque to the ladies of the Darlington branch of Marie Curie. 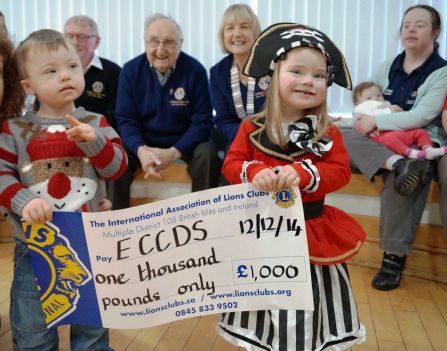 development of children with Down syndrome and is the main charity this year of the Darlington Lions Club. performance. Awards were presented to volunteers of the year by Mike Vening the chief executive of ECCDS. Several Darlington Lions and the club president Pat De Martino were invited to attend the celebrations. Maggie Hart - founder of ECCDS. Mike Vening - chief executive of ECCDS. Pat De Martino - president of Darlington Lions Club. For nearly 40 years Darlington Lions Club has hosted a monthly bingo night with prizes of sweets and confectionery and the evening was known as the Starmer Club, named after the late Lady Starmer. Due to the recent fall in attendance because of age and health problems of the players the evening is no longer viable and has recently been abandoned. Enid Gill who had attended from the very beginning until the last session had also organised a separate monthly raffle and when the Starmer Club disbanded there was a closing balance of £100.00 and it was decided to donate the money to Darlington Talking Newspapers. Darlington Lions Club matched the amount & Enid who is now a resident at Moorlands Care recently presented the cheque to Margaret Harrison ( Chair. ) & Margaret Weeks (Secretary ) of Darlington Talking Newspapers. Enid commented how much pleasure and how many friendships had been formed through the Starmer Club and thanked all of the Darlington Lions Club members past & present for their wonderful support & generosity and she also thanked Darlington Talking Newspapers as she is now severely visually impaired and relies on and very much appreciates their valuable service. The attached photograph of Enid Gill ( sitting ) presenting the cheque. Julie Curry - Deputy Manager , Moorlands Care. Beci Connor - Care Assistant , Moorlands Care. Margaret Harrison - Treasurer Darlington Talking Newspapers. Margaret Weeks - Secretary Darlington Talking Newspapers. Darlington Lions Club president Pat De Martino visited Reid Street School, Darlington on World Book Day, Thursday the 5th of March to present a cheque for the purchase of more reading books for their school library. In recent years the Darlington Lions have donated books to the school. Many of the pupils were dressed as characters from different children's books and Darlington Lion Katie Johnson joined into the spirit of the day and dressed as a lion. The school pupils are encouraged by Mr Chris Forster who is the reading champion teacher at the school, each week he assesses the pupil who has made the most progress with their reading and the pupil is then awarded a book of their choice from the Lions bookshop. Darlington Lions Club has been very involved in the programme and has donated books to several other local school & college projects and recently joined up with the Edinburgh Lions Club by providing several hundred educational books for the Edinburgh High School in Malawi. Darlington Lion Katie Johnson has also acted as a volunteer reading assistant at Reid Street school and said she had gained much pleasure and had found the weekly improvement in the young children's reading ability to be very rewarding. Back row - Teacher Chris Forster & Lion Roy Johnson. Pat De Martino the president of Darlington Lions Club visited the Rockliffe Court Surgery, Hurworth Place last week to present 95 bottles to be distributed to patients who are already on the alert list within that practice. Photograph - left to right. Lion president Pat De Martino. In December the Lions club agreed to donate 200 bottles the Parkinson's unit at the local hospital. These bottles, containing crucial medical information or allergies, are to be left in the door of the patient's fridge. In the event of an emergency call out the doctor or ambulance staff know where to look for the vital information - so facilitating the best treatment with access to knowledge of the patient's underlying condition & medication. Jean Rochester - Treasurer of support group. Sharron Mc Allorum - Assistant Practitioner. 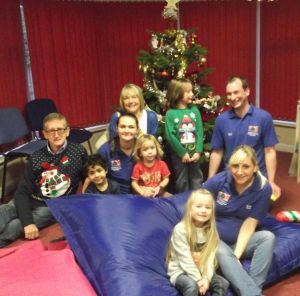 Members of Darlington Lions club received a very warm and festive welcome from the children and their parents when they visited the Education Centre for Children with Down Syndrome ( ECCDSs ) on Friday 12th December. ECCDS which is based at Newton Aycliffe County Durham serves the Darlington district and the North East and equips children with Down Syndrome and their parents with the essential skills to help them meet the future with confidence. The centre has been chosen by Darlington Lions Club president Mrs Pat De Martino as the club's main charity of the year and after the Lions had enjoyed playing games and singing songs with the children and their parents Mrs De Martino handed over the first cheque of the year and commented how much the club would look forward to many more visits and raising funds for the centre. Maggie Hart founder of ECCDS said " We are thrilled the Lions are supporting us and the fact that they have taken the time to come along and meet the children makes it very special and personal." Several members of Darlington Lions Club enjoyed taking part at the St. Teresa's Hospice Santa Fun Run on Saturday 6th December at West Park Academy when they acted as course marshals at the event. Following the Santa Run Mrs Pat De Martino the president of Darlington Lions Club was delighted to present a further cheque of £1,500 to Jane Bradshaw the chief executive of St. Teresa's Hospice. Darlington Lions Club has been a supporter of St. Teresa's for many years and in the past twelve months has raised £10,000 for the hospice and this latest donation was the proceeds of their recent annual Christmas Craft Fair which took place at the Blackwell Grange Hotel. The photograph shows the Lions along with Jane Bradshaw receiving the cheque from Pat De Martino. 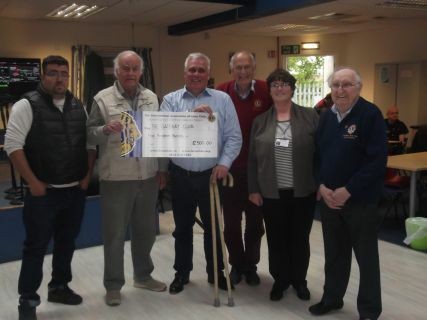 Darlington Lions present a cheque for £500.00 to the Phoenix recovery centre within Catterick Garrison. Phoenix House Recovery Centre at Catterick is one of four recovery centres of Help for Heroes in Britain which supports veterans and serving personnel who have been wounded or injured or become sick as a result of serving their country in recent conflict and provides support to full time, reservist servicemen & women from the Royal Navy , Army & Royal Air Force. Since opening its doors in September 2013 the centre has had over 12,900 residents and day visitors and over 1,300 wounded have attended the many courses which are available . The centre has been specially designed & constructed to offer the very best recovery atmosphere. It has 46 single en-suite bedrooms , four family suites, an arts & crafts room , a woodworking centre as well as training, presentation and IT suites, a gym with specialist equipment , a café & social areas also form part of the new centre. Darlington Lions Club president Pat De Martino and a group of Darlington Lions were given a tour of the centre this week by Emma Johnson of Phoenix House . Photo shows Lion President handing over the cheque to Emma Johnson. 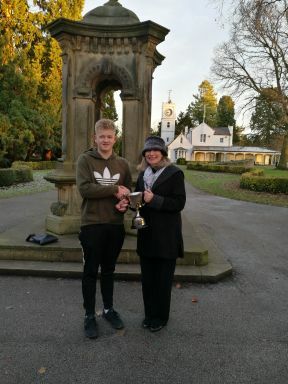 On Saturday 20th December Darlington Lions Club president Mrs Pat De Martino attended the Darlington South Park parkrun and presented the annual Lions Club trophy to Harbhag ( Harry) Singh who had been selected as the park run volunteer of the year for his outstanding contribution in organising the weekly run. The run takes place in South Park Darlington every Saturday morning at 9am. and is entirely organised by volunteers. About 200 runners of varying abilities run 5 k round the picturesque South park. Darlington Lions Club has been a sponsor of the run since it began over two years ago. The photograph shows Darlington Lions Club president Pat De Martino at South Park Darlington presenting the volunteer of the year trophy to Harbhag (Harry) Singh. At a recent club meeting Darlington Lions Club welcomed guest speakers Maggie Hart, Head of Education & Training and Jo Walker Fundraising events Organiser both from the Education Centre for Children with down syndrome (ECCDS) which is a charitable organisation based at Newton Aycliffe also serving the Darlington district and the North of England. ECCDS is the main charity of this year's Darlington Lions president Pat De Martino and many events will be arranged to raise funds for the charity. The children supported by ECCDS have a range of medical problems including visual and hearing impairments, heart problems, low immunity, and thyroid disorders. The children also face a range of learning difficulties associated with down syndrome. These may include gross motor skills (e.g. difficulty sitting & walking ) poor fine motor development and delayed cognitive skills. Some of the children have extra complex needs and although Down syndrome has been diagnosed as their primary need, they may have other challenges to face including autism or a physical difficulty. Pat De Martino thanked both Maggie and Jo for their most informative and at times very moving talk and she said that he club would now be even more determined to raise as much funding as possible for ECCDS. 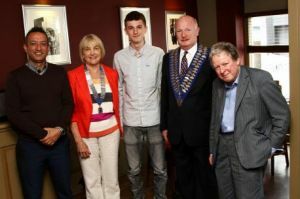 Alexander Bone, young musician of the year, has won a place at a prestigious summer school in America and loads of fundraising has been done to pay for him to go. Pictured with Alexander, centre, are fundraisers Erdal 'AJ' Kuzgun, Pat De Martino, Ken Wiper and Maurice Hawthorne. Alexander, who is seventeen and from Darlington, will spend several weeks at the renowned Brubeck Institute in California after he won a place on their intensive summer course. The teenager is a member of the National Youth Jazz Collective and is one of only three British musicians to be offered a place at the institute. He was also named the BBC's first Young Jazz Musician of the Year. His dream trip has been supported by a number of sponsors, including Darlington Lions Club. Darlington Lions Club fund raising chairman Pat De Martino organised a lunchtime collection in March in support of the Marie Curie Daffodil Appeal. Several Darlington Lions collected in the town centre and raised four hundred and eighty pounds in just over two hours. 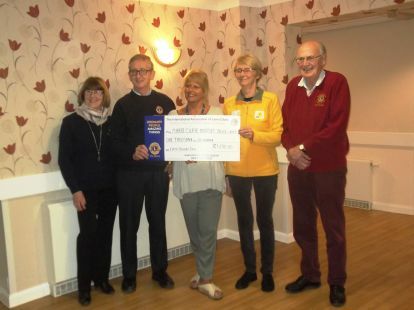 The Lions increased the amount to five hundred pounds and on Monday evening of this week presented the cheque to Marie Curie Cancer Care Darlington at their meeting at Mayflower Court, Yarm Road, Darlington. Robert Hillary the president of Darlington Lions Club said a massive thank you must go to the shoppers in Darlington town centre for their extreme generosity in raising so much money in just over the two hours for this most important and worthwhile appeal. 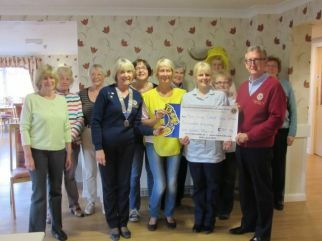 Photograph shows the ladies of Marie Curie Darlington receiving the cheque from Darlington Lions Pat De Martino & Robert Hillary. This year Darlington Lions Club president Robert Hillary has chosen the Darlington Parkinson's group as one of his main charities and this week he presented a further cheque to the group's chairman Pat McCarthey and treasurer Jean Rochester. The Darlington Lions have in the past twelve months raised funds to purchase special equipment including physiotherapy and exercise equipment, hobby tables, crockery, a new computer and storage cupboards. Darlington Lions Club has also provided the use of the Lions Club specially adapted caravan at Filey for a holiday for members of the Darlington Parkinson's Branch. Left to right - Pat McCarthy, Lion president Robert Hillary, Jean Rochester and Darlington Mayor Councillor Charles Johnson. 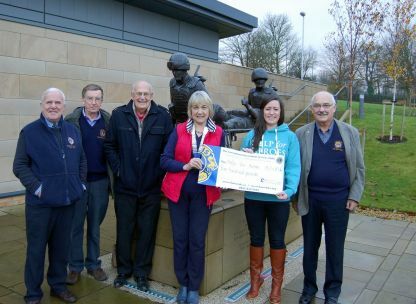 Darlington Lions Club were delighted to sponsor Susie Stephenson of Darlington Harriers club as she set off on her 9,000 mile trek to Easter Island. Susie left Darlington to run 300 miles to Southampton before flying to South America to begin her cycle trip Easter Island. Susie is hoping to raise several thousand pounds to purchase units to recycle water for the islanders of Easter Island and LIon Ian Barnes of Darlington Lions Club presented Susie with a cheque for £150.00 to help buy Biomax units for water treatment. The trip is a celebration of the 100th anniversary of the 1914 Mana Expedition, the first expedition to Easter Island by Darlington Quaker Katherine Routledge one of the archaeologists on the initial journey. Katherine Routledge was a member of the extremely wealthy industrialist Pease family of Darlington who were founders of the Darlington and Stockton Railways and the subsequent worldwide rail system. Attached photograph shows Darlington Lion Ian Barnes presenting a cheque to Susie Stephenson as she leaves Darlington on her trip to Easter Island. 2014 Darlington Lions Club Sponsor the Darlington South Park parkrun.
" Volunteer of the Year - Darlington Lions Club Trophy "
Left to right - Robert Hillary - President Darlington Lions Club. Emma Whitworth - Volunteer of the Year. Every Saturday morning at 9:00am a group of people of all ages and experience ranging from schoolchildren to grandparents and runners from many northern sports clubs and running clubs meet in Darlington's beautiful South Park to test their fitness and stamina by running around the park's footpaths over a measured distance of 5 kilometres. Since the event started a year ago the number of the number of runners has grown from 80 to 230 runners last weekend. It's just not about running but also community engagement, new friendships have been formed and now people look forward to achieving fitness and monitoring their progress. It has given an incentive for the South Park runners to take up the challenge to improve their times whatever their ability. The event is organised by volunteers who will come along and marshal the course , record positions and times and afterwards the times and results are recorded on the parkrun website. An award is made to the volunteer of the year who has demonstrated the ability to assist in the success of the South Park Run. Emma Whitworth has been selected as the " Volunteer of the Year " for her outstanding contribution to the running and organisation of the parkrun. 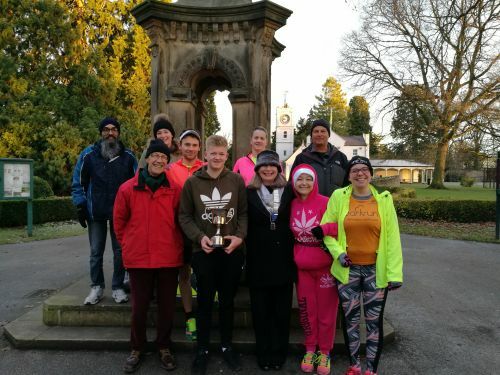 Darlington Lions Club - one of the original sponsors of the parkrun were most pleased to continue their support by making the donation of this trophy. Roy Johnson and Peter Key new members of Darlington Lions. Darlington Lions Club - Tim Grant, the Principal at Darlington College, gave an interesting talk on behalf of Darlington Partnership at our recent club meeting on child and family poverty in Darlington. Tim said that some research on this subject had highlighted that the cost of food and of fuel, elect and gas had increased by over 30% and 50% respectively over the last five years and that it is estimated by the Child Poverty Action Group that 5680 children were now deemed to be living in poverty in Darlington. During the last five years salaries had only risen by an average of 1.5%. He also informed the Lions that 66% of families living in poverty have at least one person working and this is a significant change from the past. The college and many other schools in Darlington now offer free breakfasts to students and pupils who may have not eaten or have no food in the family home. The college also offer short courses to full time students to help them understand the high costs of pay day loans, and about debt and lending generally. Food banks in Darlington have now increased to five to try and meet the demand for families in crisis. Tim commented that there has been a call to action via Darlington Partnerships where he is a board member to tackle child and family poverty. This includes the making access to food banks even more universal and tying this to high quality advice and access to affordable credit through the Credit Union. Tim challenged the Lions to look at ways that they can use their skills and expertise to support the food banks, invest in the Credit Union and support organisations like the Citizens Advice Bureau financially. Photo -left to right -Robert Hillary, Darlington Lions President, Morrison's Supermarket, Morton Park, Darlington, Tarnia Beckwith & Kelly Turrington who made up of the Christmas food parcels and Bob Martin, Darlington Lions Service committee. Darlington Lions Club members held bucket collections in store at Morrison's, Morton Park and North Road, Salisbury's, Victoria Road and the Coop at Cockerton. Christmas food parcels were then made up by the Supermarkets from the bucket collection donations made from the Supermarket customers. A grand total of 145 Christmas food parcels were then sent to Kings Church Food store, Salvation Army, Supported Living, Family Help, Grange Road Baptist Church, and 65 Primroses potted plants were sent to Town Mission. Robert Hillary, President said that on behalf of the Darlington Lions Club many thanks must go to the Supermarkets and their customers for their tremendous support. These Christmas Food parcels will assist some of the needy residents of Darlington. Donation of Art Books to College. of Fine Art & Art Foundation, Sylvia Western, Darlington Lions Club and five QE students. Darlington Lions Club have donated 20 Art, Design & Architecture Books to Queen Elizabeth Six Form College, Darlington and these will be logged and added to their library stock now totalling well over 200. These books were given by Darlington Lion Sylvia Western on behalf her niece who was also an art student. Other sections of the Art centre include Fine Arts, Textiles, Graphics, Photography all A level courses and Art Foundation a degree course. QE student, Kate Wilson on a Foundation Art Course has won major prize in a national design competition for Tigerprint who design exclusively for Marks and Spencer. Tigerprint is now going to use her winning design for M&S cards, wrapping paper and gift tags. Darlington Lions Club are this year supporting the ninth annual Best of Darlington Awards 2014 and their chosen category is - "Exceptional Teacher " this is an opportunity for children and/or their parents to recognise and celebrate teachers who went the extra mile. This connects with the International President of Lions Clubs who is challenging Lions Clubs to participate in a "Reading Active Programme " which encourages people of all ages worldwide to read books. Darlington Lions also have an excellent Charity Bookshop and for more details log on to our Fund Raising page. Robert Hilary the Darlington Lions President said 'We are delighted to donate these books to QE Six Form College and assist in progressing student Art learning in Darlington' Kath Wiper, Teacher of Fine Art & Art Foundation students thanked the Darlington Lions Club for these wonderful Art books and for their support. Darlington Lions Club has donated 50 large encyclopaedias on historical and geographical books to St Aidan's Academy school in Darlington, covering "The Earth its Wonders & Secrets", "Travel & Adventure" and "Journeys in the Past". These books will be logged and added to the stock in their learning resource centre. This library was opened in 2007 and the stock has been gradually built up over the years. Other features of the learning resource centre are numerous PC's, DVD's, CD players, Audio books, and Kindles. Between lessons a team of students run the library on a day to day basis. Julie Cuthbert the LRC manager thanked the Darlington Lions Club for the books and for their support. From left to right in the photo Robert Hillary, Darlington Lions President, Rolline Frewin, Trustee & Chairperson of Friends of Marrick Priory, Jim Gleave, Head of Centre at Marrick Priory, Bill Harker, Trustee Marrick Priory, Bob Martin, Darlington Lions. Darlington Lions Club made a donation of £250 to Marrick Priory the Outdoor Education and Residential centre near Richmond. The centre activities include Canoeing, Kayaking, Rock climbing, Zip wire, Archery, Caving, Orienteering, Team Building, Mountain Biking and many more. Over the years the centre has worked with many schools in Darlington and currently they are working with Heathfields Primary school and the Phoenix Centre. Jim Gleave, head of centre said "We would like to use the donation of £250 from Darlington Lions for our Bursary fund which exists to enable children to visit the Priory who face financial constraints. Leaders of the groups using the Priory for residential visits can apply for a bursary for children in their groups and those who receive free school meals are prioritised". Originally the centre was a 12th century Benedictine nunnery, the buildings were converted in the 1960's to provide accommodation for groups of up to 46 people. The centre over the years has been extensively developed - a recent addition being the hugely impressive "Adventure Tower"
Robert Hillary Darlington Lions President said "The centre is very impressive and plays an important role in the development of children and teenagers especially in the role of team building skills"
Lions Club donate £100 to the Red Hall Dance Company - April 2013. The Red Hall Dance Company was established in 2003 with 14 children and young people and now 10 years later has grown to 65 attending from the age of 4 to 19 years old. The dance training is carried out from Red Hall Community centre in Darlington and they meet on a regular weekly basis. They put on two dance shows each year and take part in community based events such as Darlington G.O.L.D. Tea Dance and Darlington Dance Festival. They also dance at fun days, fairs and carnival and performed in December at the Darlington Lions Christmas party for the elderly. Sarah Small the Dance/Play co-ordinator from Groundwork North East said "I would like to thank the Darlington Lions Club for their donation and this money will assist in purchasing new costumes for the shows, room hire and travel"
Lion Tony Gent the Darlington Lions President commented the Lions were delighted to give this donation and their appearance at our Christmas party had been a huge success. The Photo shows Lesley Stegner ,of Red Hall community centre Darlington and Robert Hillary, Chairman of the Lions Bookshop sorting the books. On Friday the 24th May, 200 books were donated to the Red Hall community centre in Darlington. Of these some were children's books and the rest were adult fiction. These books are then sold by the centre. Robert Hillary, Chairman of the Lions bookshop, said 'The club is delighted to assist in donating these books and we hope that they will generate some income to assist with their activities at the centre'. Interesting Sculptures from Old Books - March 2013. The Darlington Lions Club have donated 200 well used and now unwanted books to St John's School and Sixth Form College, a Catholic Academy in Bishop Auckland. Community artist Susan Warlock used the books with 40 of their year 8 students as part of a Reimagined Books workshop. The students thoroughly enjoyed cutting up the books, making various shapes and objects with excellent creativity in the form of semi abstract culture artwork. Jacquie Holloway Arts Co-ordinator said "We want to thank Darlington Lions Club for their generous donation of books" One of the students remarked this was one of best things they had done in recent times and the experience was most therapeutic. Robert Hillary chairman of the Darlington Lions Bookshop said "We were delighted to assist the school in this project and would like to take this opportunity to say that the bargain sale price of books at JUST 50 PENCE each would continue in the bookshop"
The bookshop can be found in Blackwellgate Mews in Darlington (between Boyes and Guru) opposite Binns and all money raised goes to charities. Photo left to right. 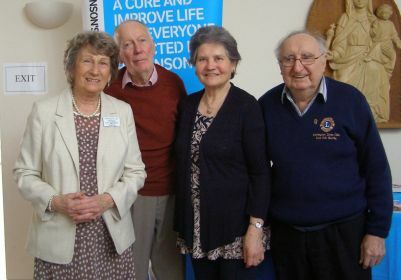 Jean Rochester, Parkinson's Treasurer, Jenny Lumley, Chair of Lions Service Committee, Pat McCarthy, Chairwoman Parkinson's and Robert Hillary Lions Vice President. Darlington Lions Club has presented a cheque for £250 to Darlington Parkinson's UK. Jenny Lumley, chairwoman of the service committee of Darlington Lions Club, presented a cheque for £250 to Pat McCarthy chairwoman of the Parkinson's UK Darlington branch. Pat McCarthy said "The charity offers information, friendship and support to local people with Parkinson's, their families and carers and they have regular events and social activities"
The money donated will be used to buy a number of new exercise mats, and these will be in constant use with exercise classes being held twice a month. These classes are run by a qualified physiotherapist who has an interest in Parkinson's at £5 per session. Darlington Lions Vice President Robert Hillary said " the club were delighted to assist this worthwhile charity and the new exercise mats will I am sure come in very useful"
On Saturday 8th December the Darlington Lions club held its annual Christmas Party for the elderly at Elm Ridge Methodist Church Hall. Eighty five elderly persons attended from all over the Darlington area and enjoyed a Christmas tea and excellent entertainment by a magician and the Darlington Red Hall Dance Company where a total of 25 children and young people took to the floor to stage a medley of dance routines from across the ages. The comments from the guests were that the dancing had been a great success and was really appreciated. The entertainment was then completed with Christmas Carols backed by an excellent pianist. Club President Tony Gent thanked all those for coming, the Red Hall Dancers, magician, pianist and all Lions and Friends of Lions for assisting in organising this Christmas party. Photo left to right are, Pat De Martino, Helen Nicholls and Richard Western. Darlington Lions Club - Past President, Richard Western and Lion Pat De Martino are pictured with Helen Nicholls Chairperson of the Darlington branch of Multiple Sclerosis Society donating a cheque for £1600. This money was raised last November by Darlington Lions Club at their very successful annual Craft Fair organised by Pat De Martino at the Blackwell Grange Hotel in Darlington. The local Darlington Multiple Sclerosis Society group covers Darlington and its surrounding district including Barnard Castle, Newton Aycliffe and Sedgefield, has 144 members and celebrated their 30th anniversary in 2012. A great deal of money has to go on transport and Aromatherapy which a lot of members find extremely beneficial and this £1600 will be used for these purposes. Their aim is to provide support, advice and guidance to people with MS, their carers and families. CHEQUE PRESENTATION - ST. TERESA'S. Jane Bradshaw - Chief Executive of St Teresa's Hospice. Robert Hillary - Vice President of Darlington Lions Club. Jenny Lumley, chair of the service committee of Darlington Lions Club, presented a cheque for £250 to Jane Bradshaw, Chief Executive of St Teresa's Hospice. Lion Robert and Lion Jenny were Shown around the building and grounds of the Hospice and the Lions commented that the facilities were fantastic and the Hospice seemed such a relaxing place. St Teresa's Hospice is an independent charity providing free care and support to the people of South Durham and North Yorkshire. The services they offer are very extensive and includes Day Therapy, Hospice at Home, In- Patients Care, Bereavement Support, Family Support, Lymphedema clinic. These services give support to people with life-limiting illness and to support their carers and to their families. Vice President, Robert Hillary said "Darlington Lions Club over many years has been a big supporter of St Teresa's Hospice and I hope to continue with this support in the future". Photo is - Tony Gent, Darlington Lions Club, President. Darlington Lions Club donate £1000 to Heel & Toe, Children's Charity. Tony said that this charity is making a real difference to these children's lives and long may it continue. Amanda from Heel & Toe thanked the Lions saying this donation of a £1000 will be used to buy an ultra-sound machine which is extremely effective for children with cerebral palsy as helps ease pain, repairs muscle damage and also stimulates their growth. So it is a fantastic piece of equipment for us to have. The main facility is in Durham but an outreach centre was set up in Darlington on the 25th September and is located in Grange Road, Baptist Church. This centre is currently open two half days and a full day on Saturday each week and the centre has already 14 children visiting from the Darlington area. Darlington Lions Club Vice President Robert Hillary presented a cheque for £250 to Sheila Woodcock of the Darlington Social Club for the Blind and Visually Impaired. The charity organises outings and activities as follows. The club for the Darlington blind and visually impaired has 25 members and meets every Tuesday morning for coffee and chat. The enjoy other activities on a fortnightly basis include a bingo/beetle drive, knitting group, table games followed by a fish & chip supper. The Club are currently organising a Xmas lunch and a shopping day in Hartlepool and the £250 that the Darlington Lions Club have donated will be used to fund the transport costs for these and other events. Cheque to Darlington Talking Newspaper - June 2012. Photo shows left to right - Margaret Harrison and Derek Mathieson joint Chairman of Darlington District Talking Newspapers and Richard Western, President of Darlington Lions Club presenting a cheque for £2000. Margaret a founder member 33 years ago and Derek gave an enlightening talk on the work of the Darlington Talking Newspapers followed by a video. A number of news teams and magazine editors of volunteers put together an almost two hour CD each week packed with the latest news from the Northern Echo, as well as what's on, and other miscellaneous features covering, history, geography, culture, medical, poetry, and many more. This free CD is then sent by post to 240 blind or visually impaired and other medically diagnosed suffers such as MS or Parkinson's disease who have difficulty reading a newspaper. This charity is run by a team of 50 volunteers bringing local news and information each week to the visually impaired in the Darlington area and is located in offices of the Northern Echo in Priestgate, Darlington. The £2,000 will be used to buy a new Computer and more Boombox Plus boxes for clients which forward the news etc by USB memory sticks. Richard Western thanked both Margaret Harrison and Derek Mathieson for a fascinating insight into the workings of the Darlington Talking Newspapers and said the Darlington Lions Club was pleased to support such a deserving local charity. This month Neil Anderson presented a cheque for £500 to John Elliston of the 700 Club, which supports the homeless in Darlington. Having given £1,300 last year this makes the total donated £1,800. The 700 Club provides 29 units of supported accommodation in Darlington for individuals and couples aged 18 and over with medium to high support needs. The money given by the Darlington Lions Club will go towards a scheme entitled 'Bridge2Home' which guarantees a bond for a year for people on low incomes who do not have money to pay a deposit to a landlord for moving into a property. Organisations and individuals can become a Pledge-holder to this scheme for more details email. bridge2home@700club.org.uk or visit their website www.700club.org.uk. 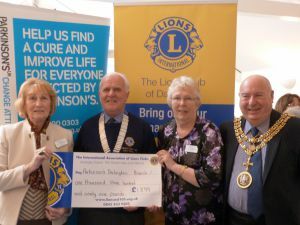 Photo shows left to right - Richard Western, Darlington Lions President, Helen Nicholls, Chairperson, Darlington MS, and Sylvia Western, Darlington Lions Club. Darlington Lions Club - President, Richard Western is pictured presenting Helen Nicholls Chairperson of the Darlington branch of Multiple Sclerosis Society a cheque for £3000. Helen gave an interesting talk on MS saying that MS is usually diagnosed between the ages of 20 to 40, more common in women and seldom in children. Overtime MS may progress further causing disability, poor co-ordination, blurred vision, numbness, loss of strength in arms and legs. For some people, MS is characterised by periods of relapse and remission while for others it has a progressive pattern. For everyone, it makes life unpredictable. You cannot catch MS and as yet there is no cure. Helen Nicholls said this £3,000 will be mainly spent on transport costs to enable members to go to the branch activities such as various Physiotherapy sessions within the area. Members of Darlington Lions Club and Darlington Council's South Area Ranger, Deborah Hall, officiated in the planting of an Arctic Beech tree in Darlington's South Park. The Darlington Lions Club donated this tree to the people of Darlington as part of the Queen's Jubilee celebration. This coincided with International Lions President, Wing-Kun Tam's, challenge to Lions Clubs around the world to plant one million trees this year and to demonstrate the strength of our global network and to assist in trying to reverse the trend of deforestation. Photo left to right- Bob Martin - Darlington Lions Club - Service Chairman. Tony Gent - Darlington Lions Club - Vice President. Darlington Lions Club donated £100 to Darlington Dyslexia Action. Marilyn Butterworth, Dyslexia Centre Principal in Darlington, said that this money would buy four hand held digital recorders. These recorders will be used by the children to record their own voices, which will assist the teaching process. Dyslexia affects approximately 10% of the UK population, which means roughly over 1500 children and young people in Darlington could be affected with this most common hidden disability. Anybody can telephone the Darlington Dyslexia Centre on - 01325 283580 for a free confidential appointment. The centre provides the following - Screening, Assessments, Literary and Numeracy tuition. Other services on offer are awareness talks and workplace consultancy. PhysioNet is a charity based in North Yorkshire, England set up in 2005 to provide physiotherapy equipment to disabled children in Eastern & Central Europe and in developing countries round the world. All equipment is donated and it is refurbished prior to shipment. PhysioNet collects surplus, unwanted or discarded - wheelchairs, crutches and other seating and mobility items mainly from the NHS and Care Homes. They will collect from anywhere in the UK. These items are then sent overseas where they are used to meet an almost insatiable need. A team of volunteers has been established to deal with the collection, cataloguing, storage and distribution. In 2011 six shipments were sent to South Africa, Kenya, Uganda, Sri Lanka and Fiji. Darlington Lions Club donated £200 to the Kumi Community fund in Uganda. This donation was given to Elspeth Robinson a retired physiotherapist who has been helping raise money for, and working alongside Kumi Hospital since 2005. The Kumi Community fund organised by Elspeth Robinson provides continuous outreach clinics where a medical team assesses the needs of children and adults with disabilities in the Kumi area of Uganda. From June to December 2011, the following numbers were screened 5974 most were children and 2438 were identified as in need of hospital treatment. The largest condition to be treated was Epilepsy. The donation from the Darlington Lions Club will be used for the purchase medical equipment and drugs to treat Epilepsy. Richard Western, President of Darlington Lions Club said the club is always willing to donate to this very worthwhile charity and commented that the Kumi Community project had been the brainchild of Elspeth Robinson. On Saturday 10th December 2011 the Darlington Lions club held its annual Christmas Party for the elderly at Elm Ridge Methodist Church Hall. 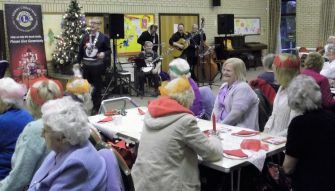 Seventy-five elderly persons attended from all over the Darlington area and they enjoyed a Christmas tea and the entertainment by the Nice 'N' Easy Band. Nice 'N' Easy Band played songs from the shows and Christmas songs. The entertainment was then completed with Christmas Carols backed by an excellent pianist. Club President Richard Western thanked all those for coming, the Nice 'N' Easy band, the pianist and all Lions and Friends of Lions for assisting in organising this Christmas party. Photo shows Richard Western, Darlington Lions Club President with guests - presenting one of the prizes from our Christmas Draw. Darlington Lions Club presented a cheque for £1300 to the 700 Club, which supports the homeless in Darlington. Dr John Elliston MBE, CEO of the 700 Club gave an interesting and informative talk saying that they manage two hostels in Darlington which provides 29 units of accommodation for the homeless. A new project running is called Bridge2Home which guarantees a bond for a year with people on low incomes who do not have money to pay a deposit to a landlord for moving into a property. Organisations and individuals can become a Pledge-holder to this scheme for more details email. bridge2home@700club.org.uk or visit their website www.700club.org.uk. The donations to the 700 Club over the last few years have assisted the funding of two projects. An Information Technology Suite consisting of five computers which has been set up to encourage basic computer skills and a large Poly-tunnel in the garden to grow their own fruit and vegetables and then to assist in learning some cooking skills. This latest donation from Darlington Lions of £1300 came from money raised at a Craft Fair held at the Blackwell Grange Hotel in November of last year. The photo shows Lion Pat DeMartino, Craft Fair organiser presenting a cheque for £1300 to John Elliston MBE CEO with Richard Western Darlington Club President and Yvonne Beattie Service Manager of the 700 Club. In March 2011 Darlington Lions Club presented a £1000 cheque to Helen Nicholls, chairwoman of the Darlington branch of the Multiple Sclerosis Society. Helen thanked Richard Western the Darlington Lions President for their generous support, saying this money will be used locally to provide members with transport to physiotherapy sessions and other important services. The group meets monthly and members are invited to regular support sessions and events. 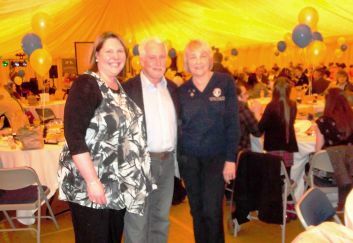 In the photo, left to right, is Richard Western, Darlington Lions President, Helen Nicholls chairwoman of the Darlington branch, Multiple Sclerosis Society, and Sylvia Western, MS committee member. Darlington Lions Club support many worthy local causes and wherever possible that includes the youth of Darlington. When the Lions Club learnt that three teenage members of Darlington Harriers & Athletic Club had achieved the distinction of being selected to take part in the International Games for Catholic Schoolchildren it was delighted to offer some financial sponsorship. As the Games took place in France help was needed with expenses. Lion President Richard Western is shown presenting cheques to Leah Kennedy, Paul Clifford and Nicole Burlinson at Eastbourne Stadium as they trained for the Games. Darlington Lion President, John De Martino, presented a cheque for £1500 from the Craft Fayre to Guy Kendrew, of St Teresa's Hospice. Pat De Martino, Friends of Lions, Craft Fair organiser, commented that this money had come from a successful Craft Fayre held on 25th October at the Hallgarth Hotel. A tour of the new Woodland Annexe completed last year was then given. This extension has increased the complementary therapies and counselling services, has enabled the existing services to operate more efficiently/effectively and has developed new services to support patients, their primary carers, and their families. It has also enabled the development of a new service to support Children and Young People who have been bereaved. 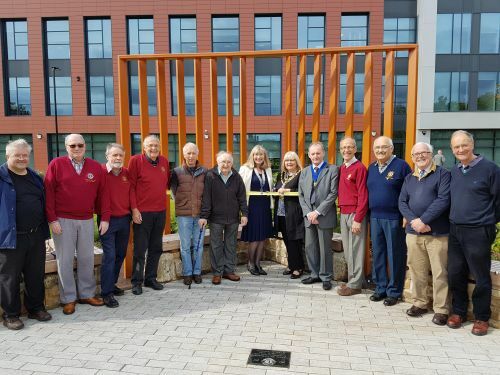 Darlington Lions and Friends of Lions thought the new Annexe facilities were excellent and will be of great benefit to the Darlington community. Copyright © 2009 - 2019 Darlington Lions Club. All rights reserved.